Our Registered dietician visited the senior center and adult day care centers and provided lectures on role of diet and physical activity on management and prevention of chronic diseases like diabetes, hypertension, kidney disease, heart disease, obesity and various cancers. It was a completely interactive session with the seniors showing a lot of interest in learning the facts and getting their concerns clarified. One on one dietary counseling was done for selected individuals who had difficulty managing their diet. Breast Cancer Awareness at Socio Cultural event: In observance of the breast cancer awareness month, ParamCARE foundation raised awareness on breast cancer early detection, screening and risk reduction, during the socio cultural event that was held at the Raritan Expo center in Edison, New Jersey on 25th and 26th October, 2013. More than 1000 educational materials were distributed and awareness posters were displayed at the event site for the people to improve their knowledge on breast cancer and benefit during their visit to the center. 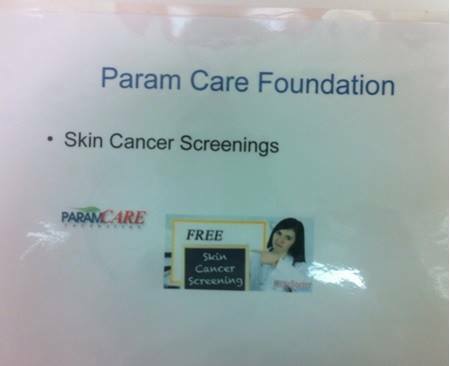 ParamCARE Foundation hosted six focus groups for Rutgers – CINJ over a period of 6 weeks to understand the level of awareness and the needs of the community with regards to knowledge about cancer, in order create a cancer education program that is exclusive to the South Asian community. Around 50 men and women of South Asian ethnicity attended the event and shared their opinion and ideas with the program facilitator. ParamCARE Foundation in partnership with Atmiya Charity, a faith based organization conducted the Breast cancer Awareness event in Lake Hiawatha, Bergen County on 6th October 2013 in recognition of the Breast Cancer awareness month. The event started with opening remarks from Ms. Bhruna Amin of ParamCARE Foundation on why breast health is important for women. This was followed by educational presentation on Breast cancer – Early detection and prevention by Dr. Jigisha Kothari, Outreach Coordinator and Council member for Asian American and Pacific Islander Advisory Council for Susan G Komen for Cure organization. Following lecture and video presentation, the attendees were educated on the need for healthy lifestyle in reducing the risk for getting cancer. During the event educational materials were also distributed in both English and Gujarati to the participants. The event ended with closing remarks from Mr. Vipul Amin, Director, and ParamCARE Foundation. 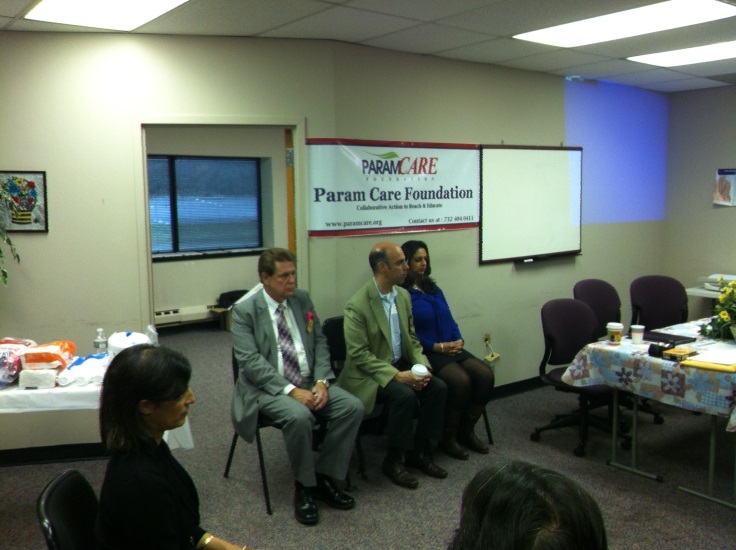 ParamCARE foundation hosted the South Asian Child Care – 2013 program at its facility in Iselin, New Jersey. The event targeted the South Asian population who are under privileged and do not have access to pediatricians, have no health insurance and are unaware of the US health care system. The purpose of the event was to improve awareness on western medical system, assist with getting health insurance and to get them connected to a pediatric healthcare provider. was conducted in partnership with Dr. Mirchandani a member of American Academy of Pediatrics. Close to 40 parents and their children attended and benefitted from the event. Present at the event were Dr. Rajinder Gandhi, Pediatric Surgeon at Valley Hospital in Bergen County, NJ, who spoke on stress management through natural ways while caring for children. Mr.Vipul Amin, Director , ParamCARE Foundation welcomed the speakers and participants and spoke about the responsibility of community leaders to make programs like these more accessible to the underprivileged population and improve awareness on leading a life that is balanced physically, mentally and emotionally and pass it on to the future generations . Councilman Jim Major of Iselin and Menlo Park terrace spoke about the need for more awareness programs like this to improve access to health care facilities in the community. Dr. Gautham Mirchandani Radiologist and Academic Advisor at SUNY Downstate in Brooklyn, NY also spoke at the event about the role of radiologist in medical care in children. Dr. Minal Vazirani, Director of Integrative Medicine at St Barnabas Hospital in Livingston, NJ spoke about how western medical system can be practiced in integration with alternative medical system. In addition to the educational presentations, free health exams for children and assistance with linking them to a pediatrician and getting health insurance were provided during the event to all the participants who attended the event. ParamCARE foundation is very committed towards improving health literacy among the people of the community and will continue working for it. Participants in the focus group were native born South Asians who immigrated to US. ParamCARE foundation hosted a program to raise awareness on prevention or risk reduction for getting cancer by adoption of healthy life style on the 8th of September at its location in Iselin. Our registered dietician gave a video presentation on the relation between obesity and risk for various cancers and the role of healthy diet, regular physical activity and abstinence from smoking and limiting alcohol on cancer risk reduction. Body Mass Index Screening was performed for all participants and was advised accordingly. Educational materials were also distributed on healthy behaviors and advantages of smoking cessation. Free yoga sessions were conducted on 2 consecutive weekends in August 2013. The participants were educated by professional yoga instructors on how to stay healthy by practicing yoga and also about its benefits with management of stress. As part of our caring for the caregiver program that is meant for providing support and recreation to our caregivers, the home health aides, ParamCARE Foundation hosted Zumba training session for them in partnership with Robert Wood Johnson University Community Health Promotion Program at its facility in Iselin on 14th of July 2013. The Zumba session was conducted by Ms. Monica Vargas of Robert Wood Johnson Fitness and Wellness Center. Nearly 35 home health workers participated in the event and were very enthusiastic about learning the dance. Participants at the event wanted to have more sessions of this kind in the future as well as it not only helped improve physical activity but also helped with stress relief in a very enjoyable and fun filled manner. A focus group on South Asian tobacco products was conducted at ParamCARE facility on 10th July in partnership with Rutgers – CINJ. The focus group was intended to understand the types and usage of various tobacco products that are widely in use in South Asia and the South Asian Immigrants. The participants in the focus group were native born South Asians who immigrated to US.